When wind turbines were designed exclusively for use on land, a clear average trend of hub height, increasing linearly in proportion to diameter had been evident, although there is always very large scatter in such data, since most manufacturers will offer a range of tower heights with any given turbine model, to suit varying site conditions. 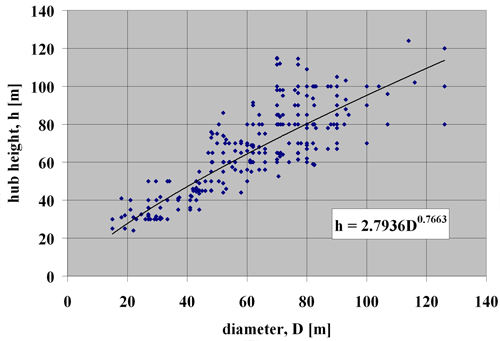 Figure 3.24 shows the trend in hub height with scale is now less than in proportion to diameter. This trend has resulted, quite naturally, from the largest machines being for offshore, where there is reduced wind shear. Offshore, the economic penalties of increased foundation loads and tower cost will typically outweigh any small energy gains from a much increased hub height. ArtWhere offers you services in Content Management System, CMS, Design, Web positioning and Hosting . © ArtWhere s.a.Neo-CMS ver 1.703 © ArtWhere s.a.